SOURCE: The Walking Company Holdings, Inc.
WESTLAKE VILLAGE, CA--(Marketwired - Oct 7, 2013) - The Walking Company, the leading national specialty retailer of comfort footwear, is proud to announce the 3rd annual 'Walking for Hope' nationwide campaign to raise $250,000 during National Breast Cancer Awareness Month to support City of Hope's breast cancer research, treatment and education program, and over 100 local charities and grassroots events nationwide dedicated to the research, prevention and treatment of breast cancer. The Walking Company's commitment to these charities will be supported through the sales from their exclusive pink ribbon collection of comfort footwear and accessories from UGG® Australia, ABEO, Dansko, ECCO and more. Since the launch of the 'Walking for Hope' campaign in 2011, The Walking Company has raised almost $350,000 towards the fight against cancer. This year, The Walking Company is dedicated to raising $250,000 through the sales of exclusive footwear and accessories adorned with the pink ribbon, the universal symbol for breast cancer awareness. 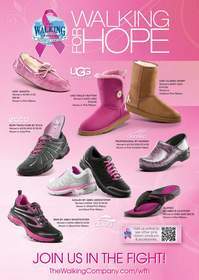 The 2013 pink ribbon collection features the most sought after comfort footwear styles on the market, including UGG® Australia boots and slippers, Dansko professional clogs, ABEO biomechanical sandals, walking and athletic shoes, and ECCO trainers. "Continuing on the past success of the 'Walking for Hope' for campaign, we are proud to support the fight against breast cancer for the third year in a row," began Lee Cox, President of Retail at The Walking Company. "Our pink ribbon collection includes the most popular and innovative comfort footwear styles available, allowing our customers to make a valuable investment while supporting the critical fight against cancer." The beneficiaries of the 2013 'Walking for Hope' campaign include City of Hope, the world renowned cancer treatment and research center, and various charities across the country. The Walking Company is also the official footwear partner for City of Hope's 'Walk for Hope' fundraising event in Los Angeles on Sunday, November 3, 2013. The charities and events were selected because of their outstanding commitment to the fight against cancer. Learn more about Walking for Hope. The exclusive 'Walking for Hope' pink ribbon collection will be available through the month of October at The Walking Company's 200+ retail locations nationwide and online at www.thewalkingcompany.com/wfh. Samples and high-res images are available upon request. The Walking Company® is the leading national specialty retailer of high-quality, technically designed comfort footwear and accessories, and offers a selection of premium comfort brands including ABEO®, Dansko®, ECCO®, UGG® Australia and many others. The Walking Company operates over 200 stores in premium malls across the nation and the company's website at www.thewalkingcompany.com. About this company The Walking Company Holdings, Inc. The 2013 'Walking for Hope' Pink Ribbon Collection.